When you first add the Jumplead code Live Chat is enabled on your website, with some default colours and information to get you going. Now if I add a quick message here while I'm not logged in to Jumplead, you'll see that the chat widget asks me for my name and email address to get a reply. This will create a new contact in Jumplead and start an email conversation. Now I'm going to jump into the settings within the messages section in Jumplead, and configure chat. From here you can disable and enable chat for your website. 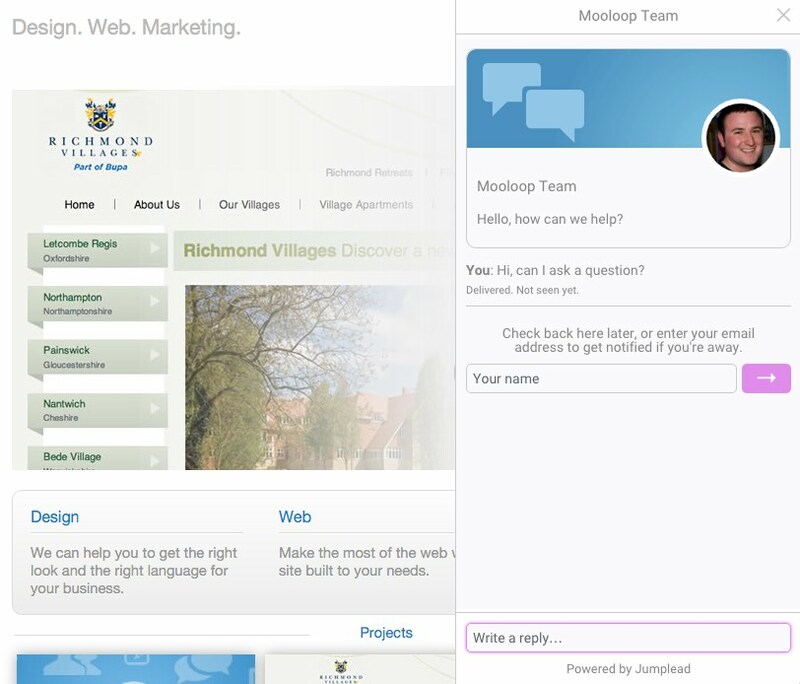 As well as manage your chat team name, the welcome message used in your chat widget, your brand colour and the avatar used by the chat window on your website. So I'll update those and go back to the website. It's worth noting that the chat box info and styles are cached in your website visitors browser, so you'll need to close and open your browser or alternatively you could use an incognito mode to see the changes that you make in settings. When I get back to my website I can see that the information there is updated. I'm going to zoom out a bit now so that you can see me as I switch between my website and Jumplead to have a conversation with myself. You'll notice that when I enter a message via the website there is a system notification in the top right hand side of my desktop, that alerts me to new messages. From the messages section, I can close, open and assign conversations to other Jumplead users. The Jumplead users that are able to use live chat are those that have been added to the conversations team within the main setting options for Jumplead. I hope this video has helped you to get up to speed with live chat on Jumplead.